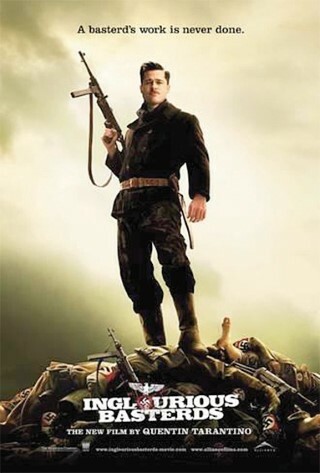 “Inglourious Basterds” is a war movie (of sorts) and the sixth feature film from Quentin Tarantino. He wrote the initial script all the way back in 1998 and it remains one of the filmmakers most ambitious projects to date. However, Tarantino couldn’t come up with a proper ending for it at first, so he decided to work on “Kill Bill” and “Death Proof” before he finally finished what he started and released “Basterds” in 2009. The result was Tarantino’s highest grossing project to date ($321 million worldwide) before being surpassed by “Django Unchained” in 2012. “Inglourious Basterds” also racked up eight Academy Award nominations, including a Best Supporting Actor win for Christoph Waltz. While much of Tarantino’s work is driven by extended scenes of dialogue, no film of his provides a finer example of this than “Inglourious Basterds”. From the opening interrogation at the farmhouse to the long sequence in the basement tavern, this movie maintains tight- rope-like tension through every single word spoken by the characters. By the time the outbursts of violence occur, it is practically relieving to be freed from the stressfulness of sheer conversation. While Quentin Tarantino crafted an absolute beauty of a script with “Inglorious Basterds”, the acting talent on display cannot go unnoticed here. Christoph Waltz was more than worthy of his Oscar win, as he completely owns each and every scene he is in. The composure he maintains while remaining one step ahead of everybody else is an absolute joy to watch. Brad Pitt also delivers an exceptional performance and his one-liners are amusing enough to keep “Inglorious Basterds” just as whimsical as Tarantino intended it to be. This depiction of the subject matter coupled with the excessive violence may not suit everybody’s taste, but the end result is near perfect for those who can stomach it. Tarantino was not that far off when he used Brad Pitt as a microphone in the film’s closing line, “This just might be my masterpiece.” My review of “Django Unchained” will be on the way next.